IMERS is recommended by a task force comprising former heads of state, leaders from government, business, and civil society from more than 20 countries in a report Facilitating an International Agreement on Climate Change: Adaptation to Climate Change (3.4 MB). 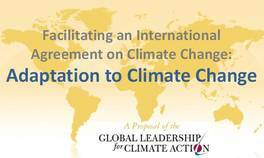 by Global Leadership for Climate Action (GLCA), a partnership of the Club of Madrid and the United Nations Foundation (UNF), sets fourth innovative recommendations to enable, finance, and govern global adaptation measures. The report was distributed to the more than 180 country representatives participating in the UN-led climate negotiations under way in Bonn, Germany. The announcement is available at the Club of Madrid. IMERS is endorsed as one of three possible sources of new financing for climate adaptation that are "adequate, predictable, and sustainable". For details see the recommendation on page 9, the financing section (pp. 24-30), and the Appendix on Proposed Sources of New Funding for Adaptation (pp. 36-39) in the Report: Adaptation to Climate Change (3.4 MB).